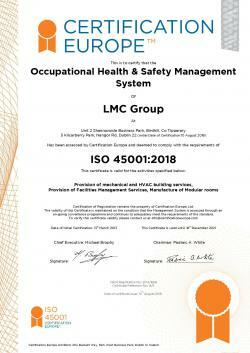 LMC Group is an ISO 45001:2018 certified company as per certificate attached. Our certifying body "Certification Europe" audit and update our Quality System twice yearly and ensure that our system complies with the latest Codes of Practice, Regulatory and Statutory obligations. As "Certification Europe" are our certifying body we have access to their technical database containing comprehensive quality control documentation in support of our Quality Management System. For further information, please contact our QHSE Manager Paula Nugent by filling out the form below.